Bold is the only word that can be used to describe Apple’s A5. It was bold to design such a large device. 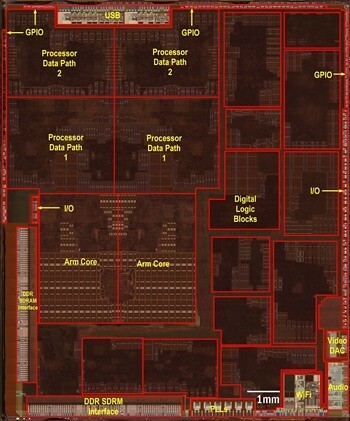 Certainly the CPU+GPU combination is significantly larger than the comparable portion of the A4. However, this is only the beginning of the story. Going beyond these basic elements leaves an additional 34 mm2 or 64 percent of the whole A4 die. Yes, there are very likely additional IP cores there, but there might also be some clever custom design that leverages Apple’s integrated approach.The much larger A5 incited some back and forth amongst analysts on Wall Street. Discussions of die cost miss the point. This is a very determined step in the emerging A-series SoCs. Apple is well aware of the costs of such a large SoC, but decided the overall system performance gains justify the increase in silicon. Is it also possible that the design has lowered other silicon, system or power consumption burdens? The point is that we need to consider the entire system. To me, this increased size is all about GPU. Sure you have another core and more DRAM, but you don’t just flip a switch and get 9X graphics. Read more at EETimes.